Christ the Redeemer is an Art Deco statue of Jesus Christ in Rio de Janeiro, Brazil, created by French sculptor Paul Landowski. The face was fashioned by Romanian sculptor Gheorghe Leonida. The statue is 30 metres (98 ft) tall, not including its 8-metre (26 ft) pedestal, and its arms stretch 28 metres (92 ft) wide. By comparison, it is approximately two-thirds the height of the Statue of Liberty's height from base to torch. 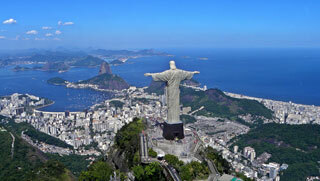 The statue weighs 635 metric tons (625 long, 700 short tons), and is located at the peak of the 700-metre (2,300 ft) Corcovado mountain in the Tijuca Forest National Park overlooking the city of Rio. This article uses material from the Wikipedia article "Christ the Redeemer Statue", which is released under the Creative Commons Attribution-Share-Alike 3.0 License.